Understand your market, communicate more effectively. We have all heard about “love at first sight” but does in ever happen in reality? Especially in a business environment? Whether that is possible or not, there is no doubt that first impressions count. And although we like to think of education as something special, the reality is that we are in a fiercely competitive field, promoting our “products” not only against those from competitor countries, but like it or not, also against similar providers in New Zealand. Most European countries, Singapore, Malaysia, China, Dubai, and now Egypt and Morocco have ambitious plans to very significantly increase recruitment of International Students, and in some cases make themselves into large scale Education Hubs. New Zealand has lost huge market share of Korean students, now studying English in the Philippines, and Malta has announced plans for significantly increasing its targets for English tuition, from an already quite large base. New Zealand’s’ position as one of the traditional 5 English-speaking countries no longer affords the advantage it once did, but this still holds some advantage. Two factors in our favour are that we are perceived by potential students as having a high ranking for safety and affordability. Safety includes not just physical safety, but health safety through our clean environment and food supply, financial safety through Student Fee protection, and safe education standards and pastoral care through compliance requirements of NZQA. Let’s also remember that particularly in big cities, agents will not try to appeal to all market segments. They may specialise in particular levels, or price brackets, or other factors. So, are you attractive for agents to send their students to you? In general, what does your school offer? Is that consistent with the price you are charging? What is your commission structure? How easy/efficient are you to communicate with? Is your campus (and your marketing collateral) attractive? There is quite a wide range of prices at all levels of education in New Zealand, and within and between regions. Of course the basic factor is the cost of providing the service, but should you consider the average cost, or the marginal cost? (That is, the additional cost in putting one more student into a classroom?) However, pricing is very often determined by assessing “what the market is prepared to pay.” Additional benefits, real or perceived, will affect the price you can successfully charge. 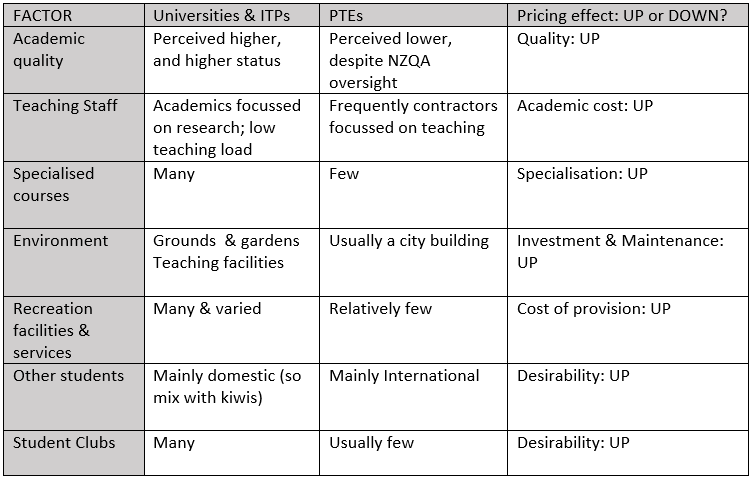 The table below looks at some factors affecting pricing for International Students in the Tertiary sector, but the Schools sector will also have factors that make one school more desirable than another, and thus justify a higher price. So, in the School sector, how will agents (and potential students) look at your price? How do the fees compare with similar schools? Is a higher fee justified by special features? Do the school offer any discounts? Discounts: The days of schools at all levels being full of rich Chinese who equate high price with high quality are well and truly gone. International Education is the realm of the emerging middle classes, who want quality, but who also want a bargain, and are often very price-sensitive. In Asia in particular, getting a scholarship is very desirable, even if it is just a discount by another name. Even some New Zealand Universities are offering partial scholarships of up to 10%, particularly in countries where they are trying to develop a new market. Scholarship price for very price sensitive markets, or for very “desirable” students. ESL schools find that Asian students enjoy having South Americans in their classes – hence sometimes offering only break-even prices for South Americans. Ensure your price is competitive for your “market position” (ie desirability across a range of factors) – and look at how you can make your “product” more desirable! Consider offering “limited time” specials: Free Airport Pickup, Free local tour, Free accommodation for first two weeks; Free SIM card etc. Remember again, that you are competing with other destination countries, and like it or not, with other schools in New Zealand. By and large, Agents are good, honest, business people who want to be fairly rewarded for their effort. And good agents are like gold – they need to be treasured! Does your commission structure reward your agents adequately and motivate them to continue to send students to you? You may have an opinion on that, but the fact is that you have to “meet the market” or you will not be successful. So, what does the market say? They have significant marketing expenses, with a lot of time-wasters and tyre-kickers. After all the effort they have made, they want to maximise their return. If a student will eventually spend several years in New Zealand, they wish to be able to get some income from every year they are here, if possible. Unlike Australia, agents in New Zealand are unregulated, and there are many sharks circling to grab students and gain a commission with almost no marketing expense at all. At the height of the “Indian waka jumping” era, there were agents waiting at the airport to intercept any young Indians, with 99% certainty they would be a student, and open to inducements of commission-splitting. There are still today agents waiting outside ESL schools offering inducements to students to enrol through them for their next course. Even in the Schools sector, there are local agents approaching students to change schools after their first year. This is all extremely annoying. So, what are the common rates in the market? *It is common now to increase Course Related Costs, on which no commission payable, and decrease tuition fees. For example: fees of $18,000 made up of $15,000 tuition and $3,000 CRC. Commission of 40% is $6000, which is “only” 33% of $18,000. *It is common now to increase Course Related Costs, on which no commission payable, and decrease tuition fees. Meet the market – whatever that is in your sector. Structure your fees to be both transparent, and flexible, and reduce your commission liability. From the perspective of agents and students, what first impressions really matter? With photos showing young people enjoying themselves – authentically? With video testimonials of satisfied students in a variety of languages? Easily navigable and mobile device friendly? Frequently updated with news and activities? Efficient, with fast response times? Clear about who should be communicated with about which issue? Friendly, but not over-friendly and casual? Containing enough, but not too much, information? With signage that is modern, bright, and not faded? Leading to entry gardens with the “wow” factor? With a décor consistent with the image (market position) you wish to project? Staffed by welcoming, friendly and efficient staff? Of course, first impressions need to be backed up with lasting impressions, because word-of-mouth is the most powerful advertisement you have – for you and against you. Did the student get a wonderful study experience? Did the student complain to the agent about any significant issues? would it make a favourable first impression on you? would your students have a favourable lasting impression?